The Google Cardboard Virtual Reality glasses is made from cardboard. It is the cheapest method of experiencing quality Virtual Reality at an affordable price. It is also the ideal corporate gift for companies that want to showcase their 360° videos or virtual reality productions. The Google Cardboard Version 2 headset is an upgrade from the original Google Cardboard Version 1. The upgrade resulted in higher quality lenses, the new Google Cardboard features Asymmetric-Bi Convex optical lenses (23 mm diameter / 45 mm focal length) it offers a superior image quality over the 40 mm – 42 mm focal length variants. The asymmetric design also allows you to see to the edge more clearly than symmetrical and/or plano-convex lenses. This small change to the original Google Cardboard Virtual Reality glasses makes the virtual experience through the new Google Cardboard much better. 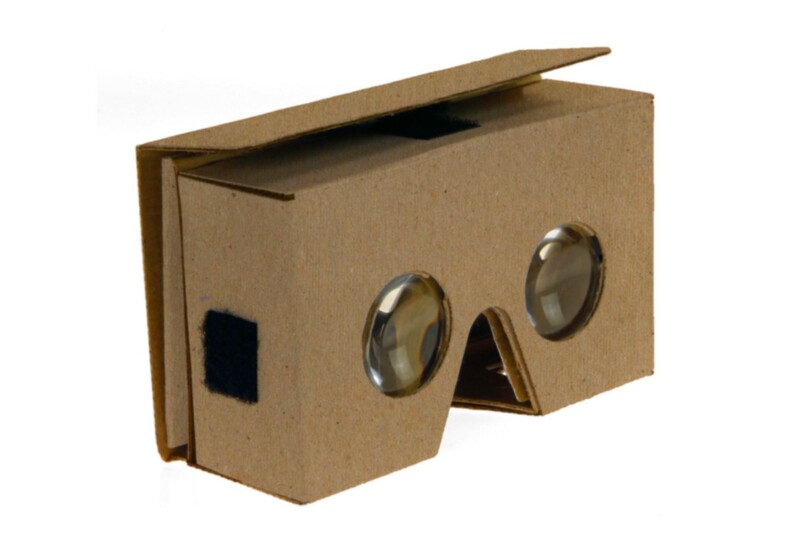 The Google Cardboard device is made from cardboard and high optical lenses. 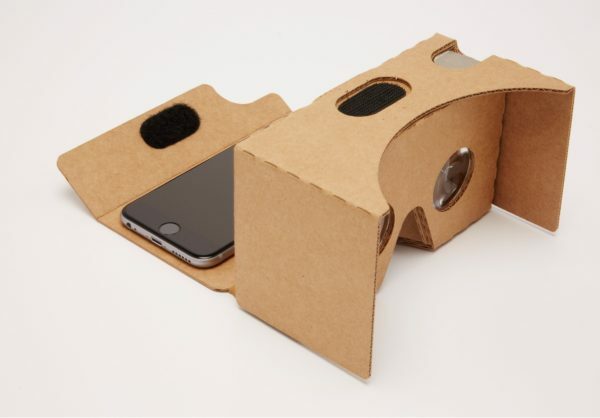 The Google Cardboard device works in conjunction with your smartphone. Preferably a smartphone with a gyro or accelerometer. This is in order to allow for head movement tracking via your smartphone. The Google Cardboard glasses works best with smartphones from 4 inches up to 6 inches. The higher quality your smartphone the better your VR experience will be. The Google Cardboard Virtual Reality headset is basically just a holder for your smartphone. The Google Cardboard version 2 glasses now also include a protective sleeve. 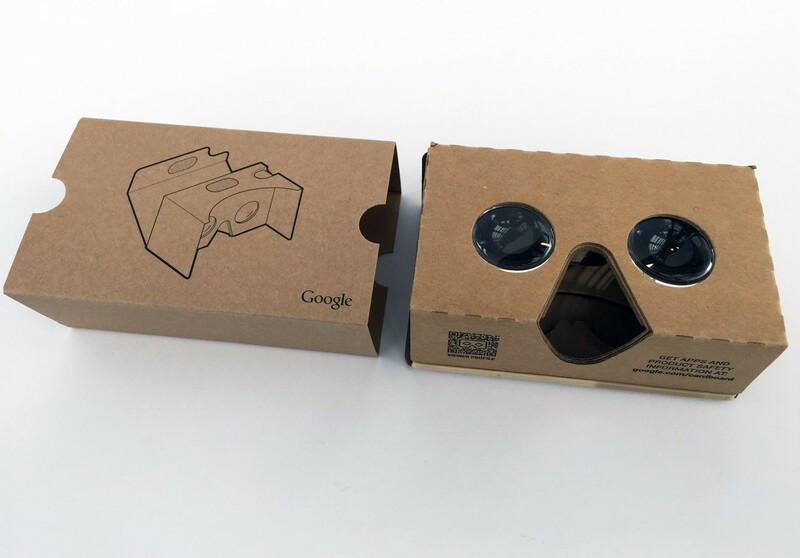 The cardboard fits into the protective sleeve to protect your Google Cardboard from wear and tear. If you are not using your Google Cardboard glasses, you can simply fold up your Google Cardboard and slide it into the protective cover. This small enhancement on the new Google Cardboard device makes the cardboard last longer. It also offer companies and brands the ideal space to brand the Google Cardboard device. The Virtual Reality company is a South African based company. 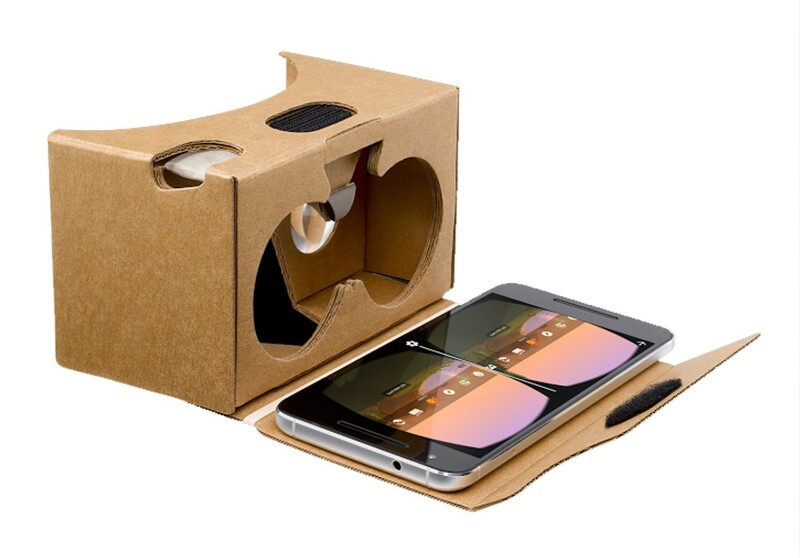 We manufacture Google Cardboard locally and also import Google Cardboard devices from overseas. Our company carries Google Cardboard stock, which makes us one of the best places to buy Google Cardboard devices in South Africa. It is however important for South African companies to note that for large orders and custom branding we need about 14 days lead time to complete large orders. 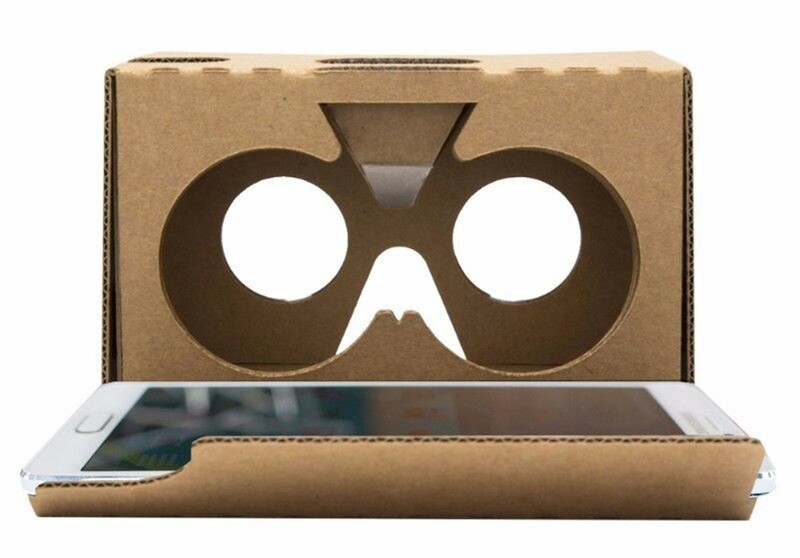 If you live in South Africa and you want to buy Google Cardboard devices you can order and purchase it from our website or you can contact us on Tel: +27 10 595 4691 for more information. If you are curios about Virtual Reality and do not want to spend a fortune on a plastic virtual reality headset, we highly recommend the Google Cardboard glasses. The glasses is currently the best selling Virtual Reality headsets in the world! The Google Cardboard Version 2 comes assembled. Cardboard lenses enable the users to focus their vision on the smartphone screen and allows the smartphone to be placed at short focal distances (2-5 cm). They are critical to providing a great VR experience for users. The Google Cardboard mechanical body consists of three distinct parts: chassis, t-shirt, and button. Each of these parts is made from E-flute, 1.7 mm thickness corrugated cardboard. Google Cardboard is delivered to users inserted into a kraft bending chip, 18 mil thickness sleeve, with the side flaps folder over. The oleophobic coating should provide water and grease resistance. It should be skin safe and compliant with the food contact regulations. The coating is applied on the user-facing part of viewer’s chassis. The button on a Google Cardboard viewer consists of two conductive parts (“pillow” and “strip”), glued to a cardboard-based “hammer”. Google Cardboard uses two round hook-and-loop velcros for the side flaps, and an oval hook-and-loop velcro for the top flap. The back flap of a Google Cardboard contains a rubber band. The rubber band increases the friction between the phone’s bottom surface and the back flap, thereby reducing the chance of the phone’s slippage. 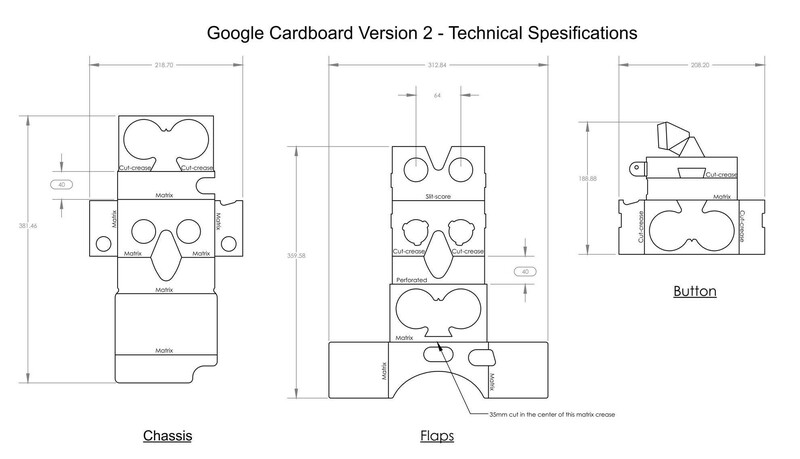 Google Cardboard contains three printed pieces of artwork: an isometric viewer diagram placed on the sleeve, the isometric assembly instructions placed on the back flap of the chassis and the QR viewer profile placed on the chassis bottom. The product descriptions and product images might slightly differ from the actual product. We take care of creating accurate product descriptions and technical specifications.